Far from the million dollar science grants and laboratories of Pasadena, and Los Alamos, in a village in Romania, and in the kitchen of a most unattractive apartment building, Gnelj stumbled across the secret of gravity control. Impossible you say? Isn’t the attraction of mass as inevitable as a slowing satellite falling to Earth? Well it should be, but Gnelj had his box, and with the box attached to any object, his joystick control that he purchased at the toy store will make that object defy gravity. At first, he would hang on to the box for dear life as he would slowly accelerate to geo-stationary speed and the world would spin around beneath him ever faster until the rotational velocity for his latitude was reached. Then he wrote some software and glued the joystick and his laptop to a piece of wood, and with the spinning of the Earth taken care of, he would hang onto the piece of wood and in the cover of darkness, rise, descend, speed along at painfully high speeds and stop so quickly it was like being in a car crash. Then he built it. A racing car seat, a welded roll cage, racing seat belts, Global Satellite Positioning, a new laptop, extra batteries, a new joystick and his second box; the whole contraption wrapped in thick industrial plastic. Without anyone seeing him he would dress for the Antarctic and travel around the world in darkness, videotaping most of it and perfecting the ugly chariot. Then he put a system in his truck and pushed and pulled it around without ever using the engine or brakes. The observant may have seen much suspension movement and the occasional hover, but he pulled it off for the most part. One clear night he realized that he was thinking too low. If only he could get a pressurized vehicle he could go into space. That took him less than a month thanks to the acquisition of a submarine. 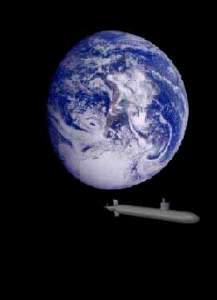 He showed his box to a friend in the Navy and took him for a ride or two, then at night his friend would untie a Sub, and when no one was looking, they would shoot up in the air and into orbit. Then came a knock on the door. They had been seen and men in black took him away. Always the sweet talker, he wriggled his way out of the submarine theft charges by offering the government the key to instant world power. Within a week, the world was shocked to hear Romania’s announcement that they had conquered gravity and were planning a mission to clean up all the space junk and debris from orbit and were offering to deliver any new satellite to any orbit or to collect and deliver any old satellite to any originating facility anywhere in the world, all without ever lighting a rocket. Oh yes, and by the way, they were going to zip over to the moon and back this week. Accelerating at one and a half G’s, Gnelj and his team of astronauts boarded their former divers decompression chamber, left Earth and sped halfway to the moon. Then they flipped over and decelerated at one G until they arrived. Aside from feeling a bit heavy for the first half and being weightless for a minute in the middle, it felt like sitting still and they stood around chatting and looking out the portholes most of the time. They didn’t have an airlock or pressure suits yet so they couldn’t get out on the moon, but they visited some Apollo sites and zipped around taking pictures of interesting rocks etc before sliding home in comfort. With most of the orbital junk removed and many new satellites in orbit, Gnelj set his billionaire eyes on the stars. Soon dozens of tiny spacecraft were accelerating at incredible speeds toward numerous stars in search of life on their planets. Gnelj himself got bored with visiting the moon and Mars and instead sold thousands of units to retrofit airplanes and soon brand new spherical aircraft without wings or engines were flying commercially in and above the atmosphere and landing without runways anywhere they liked. They were called Gnelj balls. Almost every tall building in the big cities had it’s own airport, right where the helipad used to be. The problem was, it was impossible to control immigration and almost anyone was soon able to go wherever they liked. This included the penniless natives of third world countries who now wandered homeless around the nicer spots in the world. Tropical paradises were now crowded and criminals and terrorists were avoiding capture all over the place. But in general, the human race found it’s own ways to level it out and regional conflicts died down as a result of the new mobility. After a few years and few epidemics, world health found it’s new level and some wars were avoided because people who thought they hated each other could get away instead of being stuck in the fight. Anything could be moved. You could go anywhere. The oil industry was just for classic cars and vintage planes. The cities were much less noisy. The air was as clean as it was hundreds of years ago. Containers moved without ships. People moved and took their houses with them. Everyone locked their balcony doors and upstairs windows. Many “Keep Out” signs were purchased. And Gnelj laughed a lot. Jeffrey the Barak is the publisher of the-vu and is certainly not the first to dream of an Anti-Gravity revolution.